Buddhism is the primary religion of Laos. The preferred style is Theravada. Lao Buddhism is a unique version of Theravada Buddhism and is at the basis of Lao culture. The Pha That Luang, Wat Sisakhet, Wat Xieng Thong, and That Dam are all Buddhist structures in Laos. Lao Buddhism is also famous for images of the Buddha performing uniquely Lao mudras, or gestures, such as calling for rain, and striking uniquely Lao poses such as showing the Buddha lying down and welcoming death, after which he would achieve Nirvana. In the Pra Lak Pra Lam, the Lao Ramayana, instead of having Rama portrayed as an incarnation of Vishnu, Rama is an incarnation of the Buddha. Lao people have also written many versions of the Jataka Tales. Lao Buddhist are very devout and almost every Lao man joins a monastery, or temple, for at least a short period of time. Many men also become monks for the rest of their lives. Most people donate food to the monks to gain merit and improve their karma. Even though these Buddhist practices can hurt the economy, most Lao people are willing to sacrifice. 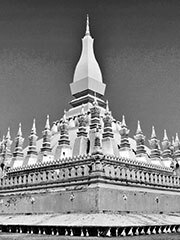 The temples of Laos were once seen as «Universities» for monks. Lao monks are highly respected and revered in Lao communities.